All woodworkers know how important it is to keep your kit sharp. Over time, you can accumulate a lot of sharpening gear, from grinders to stones, but how do you keep it all clean and in one place? Here at WPP, we have set about coming up with a design for a sharpening station that will help you store and use your sharpening kit. Anthony and I put our heads together and came up with this simple design that you can keep on a bench, or actually screw to your workshop wall. You could even use a pulley and rope system to pull it up into your workshop roof space and then drop it onto a bench, if space is an issue. 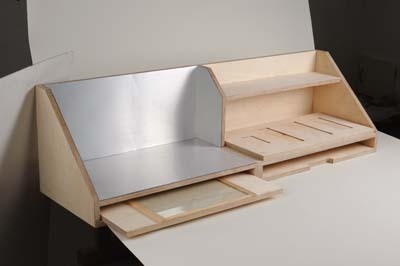 We made it of 18mm birch ply, but MDF or a lower quality ply would do just as well. 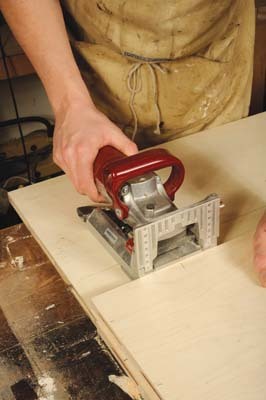 All of the joints are made with the biscuit jointer for speed, but you could equally well, cut housing joints, or screw and glue. Here's how we built it. We designed the station to be made from one large sheet of ply. Our timber merchants have an industrial sheet converter, so we had them convert the ply into sizes manageable for the back of our Anthony's motor, and which allowed for the design. 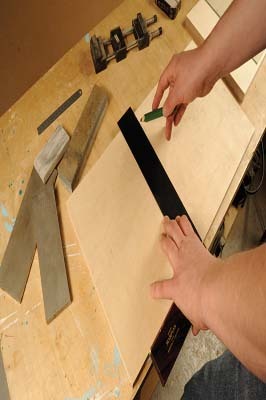 Then it was a case of marking up those remaining pieces, ready for conversion by our workshop man-made board cutter. 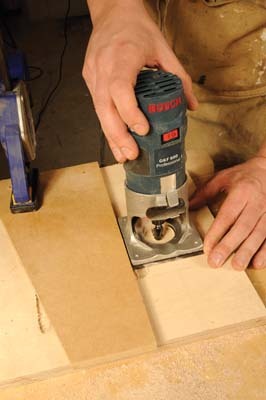 The Mafell mini board saw, with it's bespoke straightedge, makes easy work of converting any board material. I converted them to the overall dimension, then marked off the slope and cut it with the bandsaw. A few strokes with the plane tidied up the cut edge. The biscuit joint was my preferred method of construction. 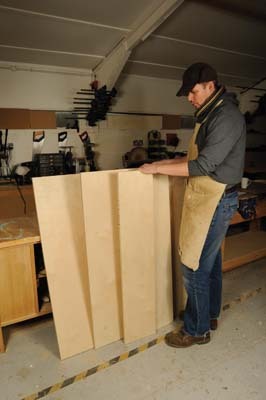 This makes conversion of the carcass pieces very simple â€“ it is easy to work out lengths as you are not allowing for joint sizes, and construction is easy too. 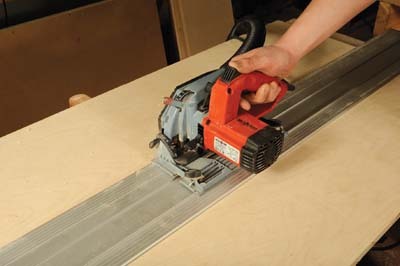 The biscuit jointer is speedy to use and quite forgiving. To mark your biscuit positions, always work from a face edge and mark up both sides of the joint at the same time to avoid confusion. 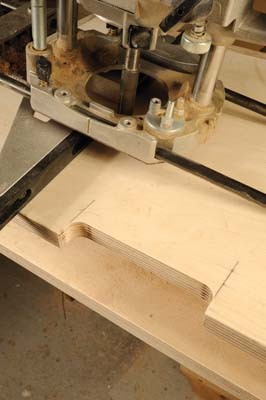 to cut my slots in board ends using the jointer flat reference face, rather than use the jointer's fence. This can cause a little confusion, so take care. 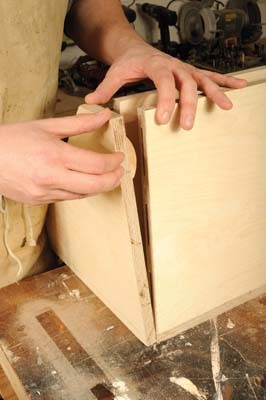 If all biscuits and slots line up, then go ahead and glue up the main carcass. You can buy glue applicators for slots to make the job a little easier, but I find just using a glue bottle is perfectly adequate. Donâ€™t over apply glue, as it has a tendency to go everywhere! Once everything is glued I clamped up the main carcass and left it to go off. 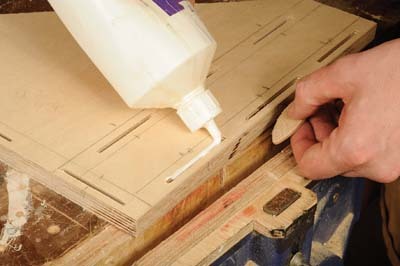 Clean off any excess glue as you go. 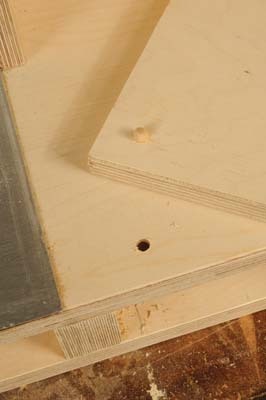 For the small shelf and upright, I left cutting the ply to the final size until after construction, and then marked off all sizes from the glued up carcass. This allows for any slight discrepancies in the carcass, and is a good technique whatever carcasses you are putting together. 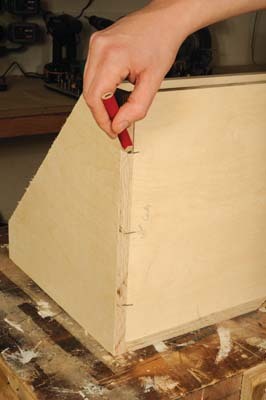 This method also allowed for cutting the biscuit slots in the carcass after it was glued up. Once a dry fit was made to check the joints, I again glued and clamped this part of the station up. 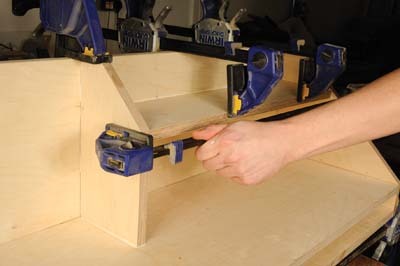 I made the central divider for the drawer section with a double thickness batten of ply, which I glued and clamped together, before cutting to final size after the glue had set. I then glued and screwed this in place from underneath, and applied a clamp to ensure good adhesion between the batten and the top of the drawer section. Once the glue has gone off, then tidy up the station. Plane any of the ends that are a little proud and then sand off the whole thing. Don't go crazy as it's only a workshop station. Make sure you plane and sand off all the arrises. 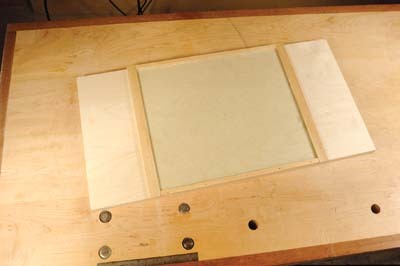 The next job is making the drawers for your sharpening stones and glass sharpening plate. Use your stones to mark this up on the stones drawer. 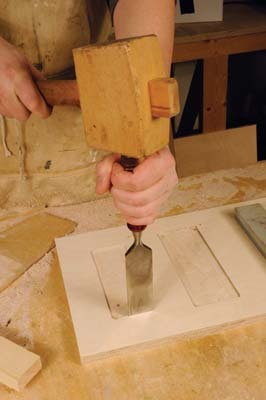 Then use a router and straight cutter to make a 5mm recess for your stone. 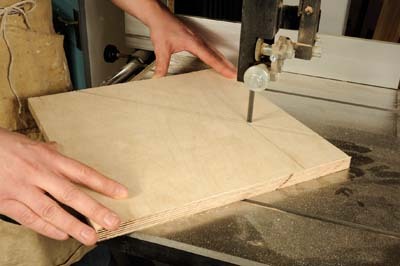 I simply used a trimmer, straight cutter and a straightedge, but you may want to make an MDF template for use with a guide bush. 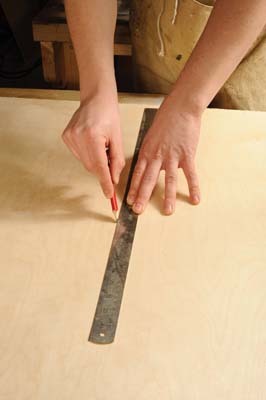 I set the cutter to depth and gently made a drop-on cut to start of the recess. I went along all the sides with the straightedge, and then cut out the inner waste freehand, taking great care. 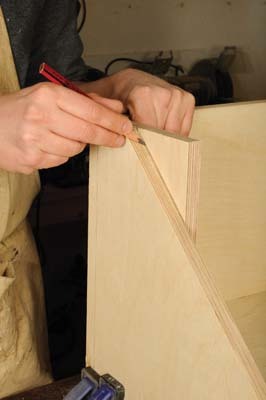 After cutting the recess, you will need to square up your corners with a nice sharp chisel. 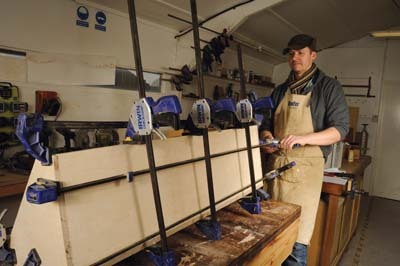 The sharpening glass, which will be used in combination with emery paper to create a perfectly flat honing bed, is held in place with battens, which hold the glass in place and keep sharp edges hidden away. Always use 6mm thick flatness. 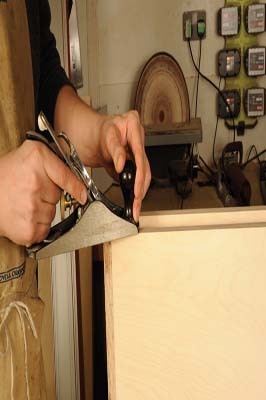 To make pulling the drawers out nice and easy - they are quite heavy with your sharpening kit in place - the carcass needs pull slots cutting in it, so you can grasp the drawers. 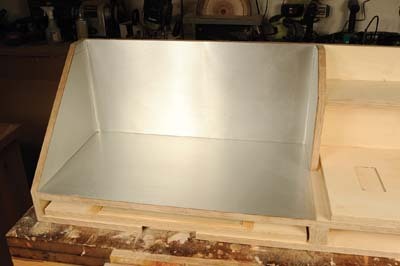 Use a large straight cutter and fence, and a push in cut from the side to make this. You may want to rout in corresponding grooves in the underside of the drawers to help you grasp them. 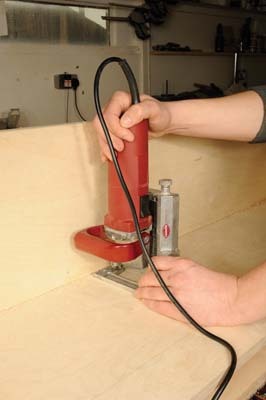 The underside of the drawers also need locating dowels in them to lock onto the station worksurface. 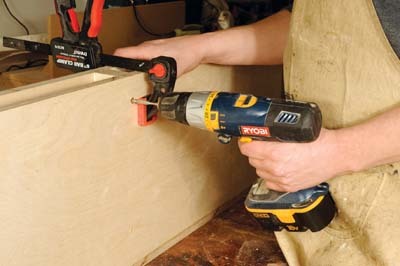 Drill and glue stubby dowels in place, and then drill corresponding holes in the station top. As a final touch, the section that takes your grinder was lined with aluminium - you could use any other fireproof material - to ensure there is no problem with sparks from your grinding... this also makes cleaning the area easier! If you miscut a biscuit slot, it is easy to fix. Simply glue a biscuit in the miscut slot and when the glue has gone off, saw the biscuit flush. As long as you have not cut the slot in totally the wrong place the misplaced biscuit will be hidden, and if you need a biscuit offset from the miscut slot, simply cut a new slot over the glued in biscuit, and the joint will still be strong.